This year I have made it my mission to take better care of my skin. As I have mentioned in previous posts I love using Lush skincare products due to how fresh and natural their ingredients are. Another great thing about Lush skincare is each product is designed to help a certain skin type, with ingredients chosen with that in mine. This makes it is super easy to find a products to best suit your needs. At the moment I have been suffering with really dry skin, I’m not sure if this is due to the weather or my skin type is just changing. As I normally have very oily skin. However due to this I wanted to try a moisturiser designed to help dry skin and add a little hydration back into my skin. 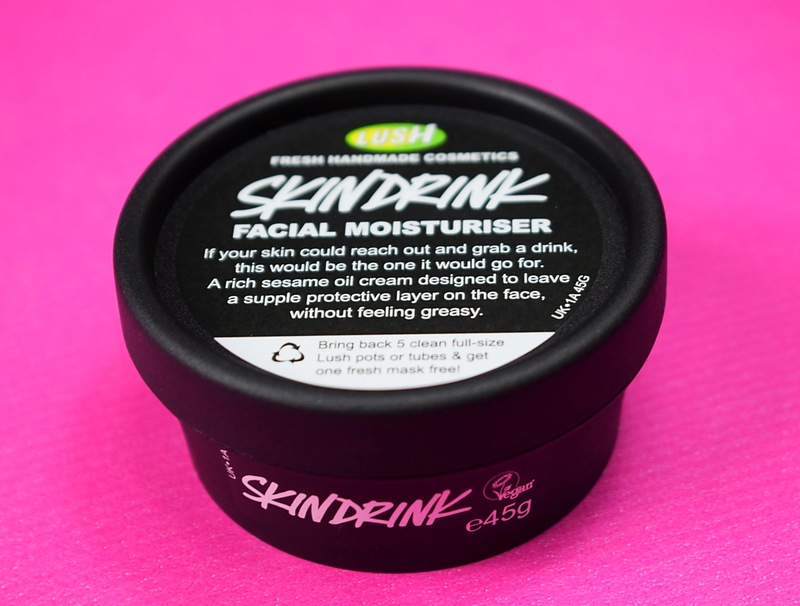 The Skin Drink moisturiser is designed to quench thirsty skin. Containing a whole host of oils and butters it creates a barrier against the elements and helps skin to feel much more supple. Containing avocado, rose and orange I was expecting this moisturiser to have a subtle floral or fruity fragrance. 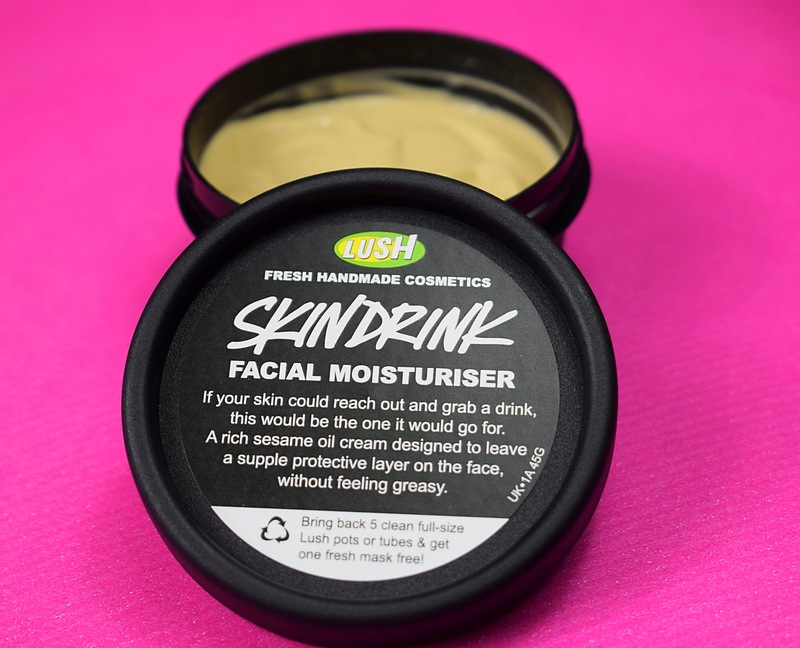 However I found the Skin Drink moisturiser to have A very peculiar scent and one that I can’t say I am very fond of at all. The scent is quite hard to describe but it is quite earthy and a very strong scent. 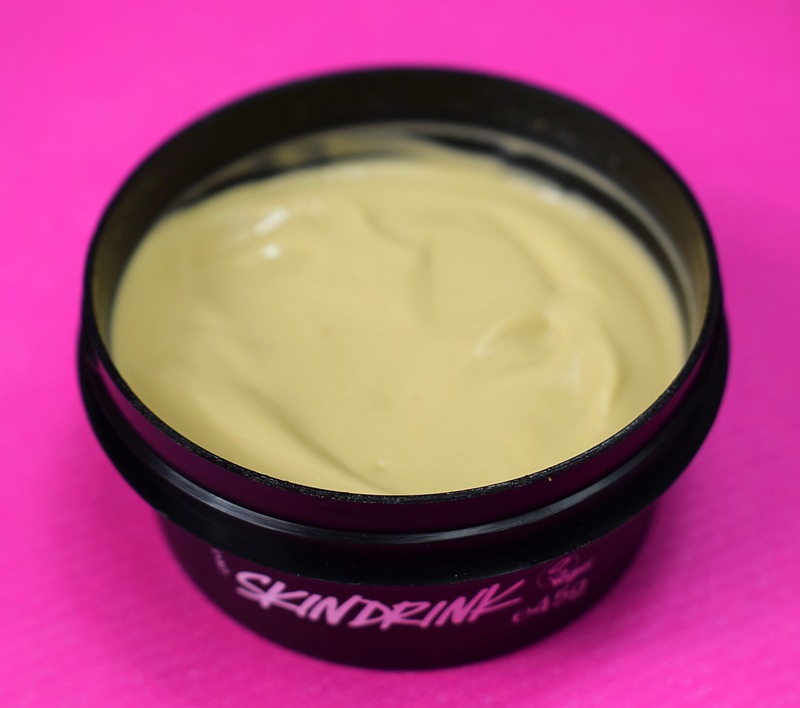 I personally prefer a scent to be very lighter when in a facial moisturiser and found the Skin Drink scent a little heavy going. The consistency of this moisturiser is very creamy and it applies very well with a beautiful luxurious feel. Due to the heaviness of the cream I feel it is a little more suited as a night cream. I was a little disappointed to find how greasy this moisturiser left my skin, especially as it says it won’t feel greasy on the pot. Although if using this as a night cream the greasy look does not matter too much I personally do not like the feeling of having a greasy face. One great thing about this moisturiser is it defiantly adds a lots of hydration to your skin. The Skin Drink moisturiser left my skin feeling very soft and eliminated my dry spots of skin almost over night. I would recommend this moisturiser if you have very dry skin or are after a dose of hydration for your skin. I personally wouldn’t use this moisturiser all year round and would keep it for colder months when my skin is at its driest.